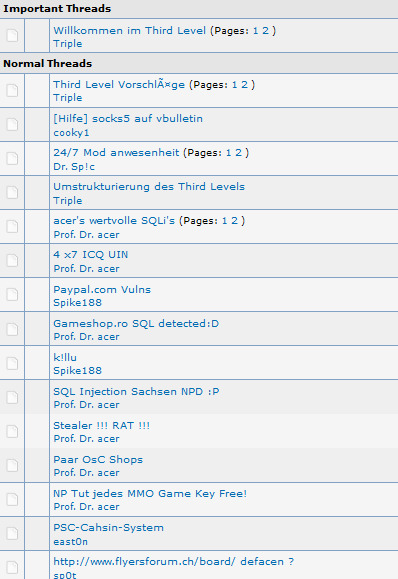 HBA Crew (german carder forum) get hacked ! Now it's official: HBA-crew v2, was hacked! Ip 'were logged, Database is public! Now we can not hide it anymore. geloaded Since yesterday evening by a leak in the server the entire database of HBA, packaged and put on various public OCH's been. Because, unfortunately, still in some areas, no IP logging was disabled, we ask you immediately to secure your systems. It's just a matter of time. Starting with the great and stopped at the small. The forum is in the background already reorganized. According to the internals using Co.Admin TheSaint was - made possible the leak. No one can be trusted - unfortunately. "Hacked by a pro of the scene"
Well, the dump is open to all and put on as usual. This time it's no April Fool's joke but (sadly) the truth. HBA crew was hacked and is offline until further notice. About IP logging we have to say nothing, because there is nothing to say on the subject. Conjecture we leave as another. Who is behind the "hack" is inserted quite uninteresting. At least for me. To 6.4.11 will change one bit right. HBA will definitely come back there is no question. When and how did you learn on Twitter that is updated in real time.